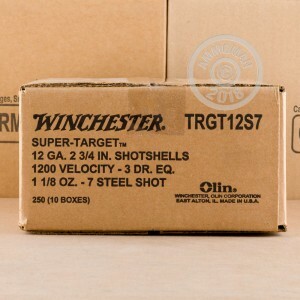 Winchester will help you get the most out of your day when you go shoot clays! 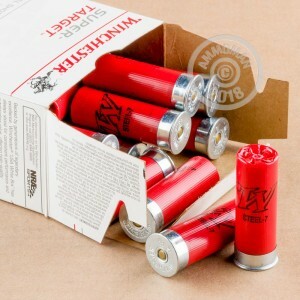 This 12 Gauge 2 3/4" #7 Steel Shot will exceed your expectations of a high quality ammunition choice. 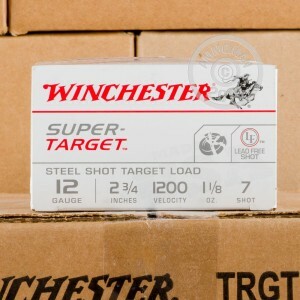 Winchester Super Target loads contain 1 1/8 ounces of #7 steel shot, and has more pellets per ounce than lead. Also, because these shells are made of steel rather than lead, they reduce the amount of contamination to the water supply when you shoot near it. These 12 Gauge 2 3/4" long shells are delivered in brand new condition and will not corrode, making them an excellent choice for all-weather conditions. With a velocity of 1,200 feet per second, they are an ideal load for fast-moving targets. This product is manufactured by the Olin division of Winchester. Olin has provided a great deal of ammunition to the United States military. Much of their ammunition was used during the Persian Gulf War. Together, Olin and Winchester have created a brand that stands above the rest.